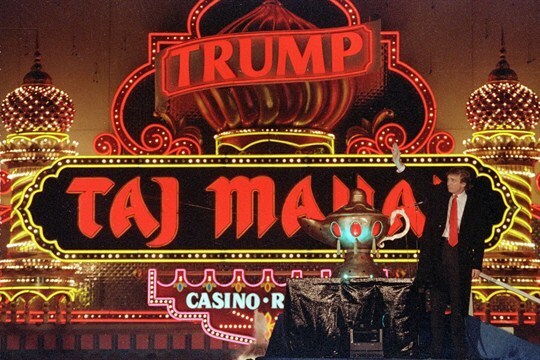 Donald Trump stands next to a genie’s lamp as the lights of his Trump Taj Mahal Casino Resort light up during its opening in Atlantic City, N.J., April 5, 1990 (AP photo by Mike Derer). Donald Trump campaigned for the presidency in 2016 based on his celebrity status and his reputation as a maverick businessman, vowing to run the country as he ran his real estate empire. The renegotiation of the trade deal with Mexico and Canada formerly known as NAFTA, announced this weekend, is the latest example of how in one striking way, he has been true to his word. The problem is that Trump was a more successful self-promoter than businessman, and the results are on display in the trade deal as well as other aspects of his foreign policy.